Flexible Partial Denture - Dental Lab. Dental Laboratory for Flexible Dentures. Our Flexible Partial Denture is a great alternative to the standard acrylic and provides a light weight and flexible, comfortable fit for your patients. Our Flexible Partial Denture is made from TCS nylon based material and is virtually unbreakable. Our TCS Flexible Partial Denture is metal free, stain resistant and provides a natural look and feel that your patients would love. We also offer our Flexible Partial Denture in Valplast material. 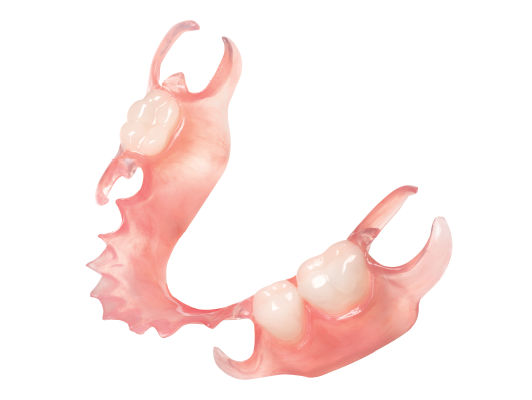 Valplast is the original flexible material for partial dentures and is strong and durable. The color, shape and design of our Valplast Flexible Partial Denture blends in well with the natural appearance of the gums, making the partial virtually invisible.